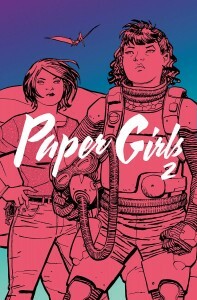 New Paper Girls & More Signed by Brian K. Vaughan to Benefit CBLDF! This week CBLDF is rewarding your donations with some great graphic novels, including the soon-to-be-released Paper Girls Volume One hardcover, signed by Brian K. Vaughan; Paper Girls Volumes One and Two trade paperbacks, signed by Cliff Chiang; Paper Girls enamel pin sets; Saga Book One hardcover, signed by Brian K. Vaughan; and Private Eye hardcover signed by Brian K. Vaughan! Keep reading or follow the links for more information. We’re also offering the first two Paper Girls trade paperbacks, both signed by illustrator Cliff Chiang! 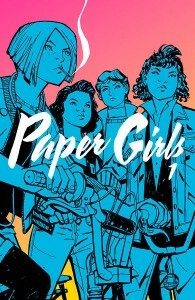 The first volume collects Paper Girls #1-5 and is available here. 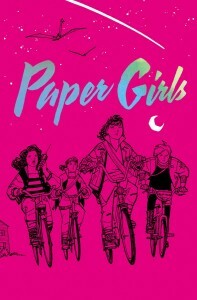 Volume two collects Paper Girls #6-10, and is available here! 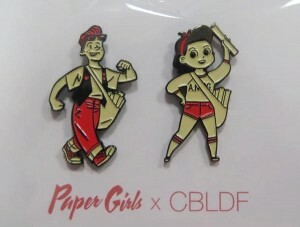 And don’t miss out on our exclusive Paper Girls enamel pin set – donate here to grab your very own Rita Pearl and Petey Boy! If you haven’t had a chance to pick up Saga yet, now’s the time to get started with this Book One deluxe hardcover edition, signed by author Brian K. Vaughan! Don’t wait, donate today for your own signed copy of this smash-hit series! 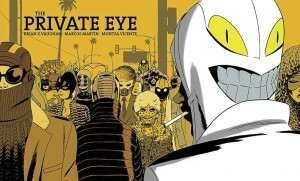 Don’t miss out on The Private Eye Deluxe Edition hardcover! This excellent book collects all ten issues of the Eisner Award-winning “Best Digital Comic,” now available in print at the behest of readers and retailers everywhere! This hardcover presents the story in its original widescreen format and is available here signed by author Brian K. Vaughan!